What can 11 girls on scooters accomplish together? Maybe they can go for a fun ride across the town, eat off popular joints and come away with clicking some happy memories. A scooty is just about perfect for that relaxed ride across the little sidelanes and familiar streets leading to the bazaar, meeting up friends over chai or dropping your child to school. A scooty is certainly not meant for riding on tough terrains. Or, is it? There is one scooty, the TVS Scooty Zest 110 that has just proved how good it can be as an endurance bike. In September 2015, TVS had partnered with Anam Hashim, India’s youngest female stunt rider to ride TVS Scooty Zest 110 to Khardung La. The ride flagged off from Jammu to Kargil followed by Leh and Khardung La ending at Amritsar via Manali. Braving rapidly changing weather conditions, unpredictable terrain, and the twisted roads, TVS Scooty Zest 110 made it to Khardung La. This feat won accolades for Anam and the TVS Scooty Zest 110 became the first 110 scooter to scale Khardung La, earning it a place in India Book of Records. 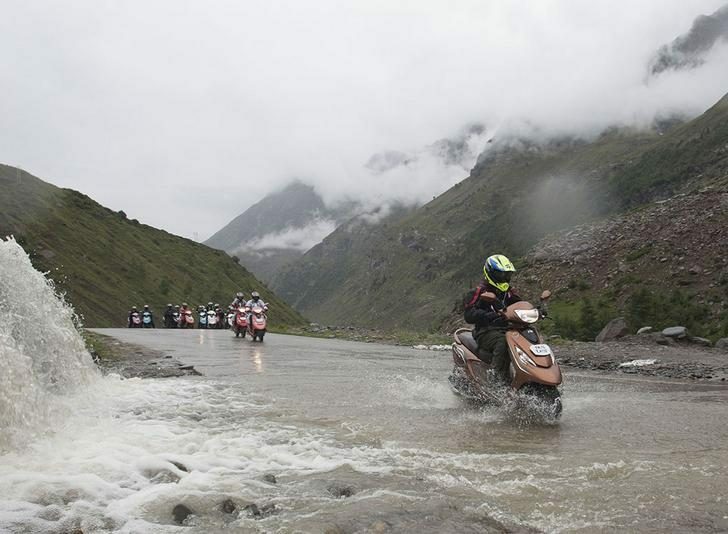 “When we concluded the first season of Himalayan Highs, the campaign garnered immense appreciation for the capabilities of both the rider, Anam Hashim, and the machine, TVS Scooty Zest 110. We also had many queries from women eager to attempt the same. They wanted to experience the high of riding the TVS Scooty Zest 110 on the most challenging terrain, setting records, and replicating Anam’s zeal to explore the unknown,” Aniruddha Haldar, VP- Marketing – Scooters, TVS Motor Company shared with Lighthouse Insights. The selection process for Season 2 kicked off in June 2016 and was met with tremendous response. Participants had to register for the ride via the TVS Scooty website. The basic eligibility criteria included – Indian national, female, above 18 years of age, had to know how to ride a two wheeler/scooter along with a valid driving license. The selection process witnessed about 50,000 enquires and over 2000 entries from women riders and enthusiasts across all 29 states and select union territories. The registrations concluded on July 5th after which the contestants were evaluated and 10 were shortlisted based on psychographics, physical fitness, mental strength and above all riding prowess. TVS Motors launched a 7-part web series on its YouTube channel Scootygals, wherein audiences also get a sneak peek into the journey where with each passing day the 11 girls become an advocate of the TVS Scooty Zest 110. Episode 1 of the series gives a brief history of Season 1 and introduces the 11 final riders of Season 2. TVS got on board independent filmmaker Amit Masurkar (of Sulemani Keeda fame) to direct the episodes which play out like the kaleidoscope of life, unique, yet tangible. 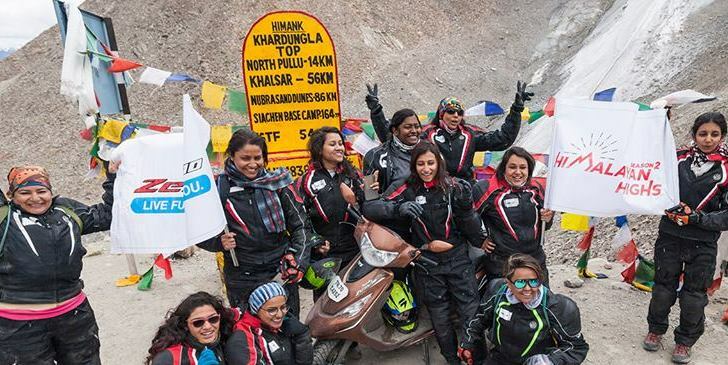 The webisodes comprised interesting themes – Friendship, Colours, Selfies, Anticipations, Zest and All highs, to help capture the girls’ experiences from the time of selection, to training, to riding and finally celebrating the successful completion of their journey by registering their accomplishment in India Book of Records! TVS wanted to look at a campaign that would convey real life relatable story of success and achievements to its target audience- ambitious and adventurous youngsters, who are willing to take risks to follow their dreams. “In an age, where visual content drives the audience’s digital experience, we wanted to create an engaging parallel narrative which would highlight a 110 cc gearless, sturdy and comfortable vehicle and the 11 strangers’ (who eventually turn into each other’s friends and strength) journey to the world’s highest motorable road against all odds reach out to the youngsters, our target audience, through a real life example, reiterating what they strived for, Live Full. Be You,” Haldar shared the story behind the chosen themes. The webisodes were promoted on Scooty’s YouTube and Facebook pages, while the brand’s website shares about the challenge, the rider profiles, a gallery, and of course, the TVS Scooty. “We also tried an influencer marketing campaign wherein several youth influencers watched the webisodes and talked about it on Twitter, resulting in tremendous organic traction, Haldar revealed. Himalayan Highs Season 2 truly brings alive the brand proposition of “Live Full. Be You.” While the girls maneuvered across tough terrains, braving all kinds of weather in the high altitudes, to finally give wings to every rider’s dream, they also became advocates of the TVS Scooty Zest 110. Bringing their journey in the form of themed webisodes has further amplified the brand promise with real stories. In all likelihood, Season 3 might be shot live and shared on social media in real time. Given the experience gained from season 2, what new can we expect in season 3? He said it is too early to comment. “You’ll have to wait and watch!” We are doing that already!